An expensive healthcare system that delivers poor outcomes threatens our health and undermines our economy. 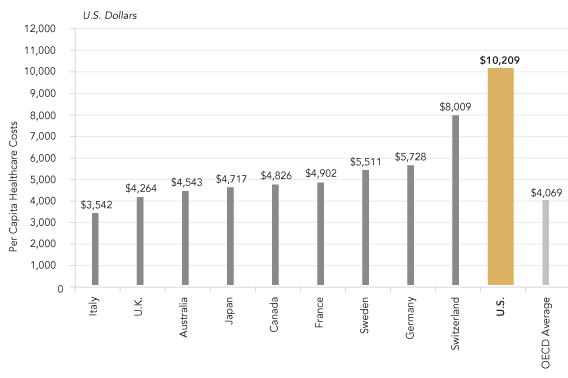 At a total spend of approximately $3.7 trillion, or 18 percent of the national economy, the U.S. healthcare system is the most expensive in the world. Yet, our health outcomes are worse than many other nations. Americans often endure unnecessary, ineffective, or even harmful treatments, lowering the quality of their lives. The high cost of healthcare makes everything in our economy cost more, reduces incomes, and threatens our future prosperity. Why Does Our Healthcare System Perform So Poorly? A primary reason why our healthcare system underperforms is that the typical factors that fuel improvement and innovation in other industries lie dormant in healthcare. Employers and insurers often assume a passive role, accepting annual cost increases, and eventually just passing them on to customers and employees. Providers generally operate under a perverse fee-for-service model, in which they are compensated based on the volume of their services, rather than the value of the care they provide. Under this system, the demands and rewards for quality, efficiency, and price sensitivity are sharply reduced. These poor incentives also contribute to a broader failure to invest in prevention and early interventions that can improve health and reduce cost in the long run. The good news is that there are many opportunities to transform American healthcare into a high performing system that provides higher quality care at a lower cost. The Peterson Center on Healthcare works with key stakeholders to spark the adoption of innovative solutions on a national scale. By doing so, the American people will live healthier lives, and have more resources to invest in our collective future. Meet some of America’s top performing clinicians.